This is just to let you know that as I have moved the blog to my own webhost (from the wordpress.com platform) which mostly affects readers in China who no longer need a VPN to view the Shanghai Street Stories. The website remains www.shanghaistreetstories.com but it is likely that those who had subscribed to the blog early on may have to check your email subscriptions, RSS and Google Reader. Someone mentioned that he has not been receiving notifications of my latest posts. One problem could be that you are still subscribing to shanghaistreetstories.wordpress.com which from here on, will be defunct. If you are still experiencing problems, please contact me via the Contact Sheet. I will do my best to help. My photo exhibit, interviews, photo essays and … we’re moving! Contrary to the radio silence that some may have noticed, many exciting things are afoot here. I will be updating this post for the rest of the week and we will resume business as usual next Monday. 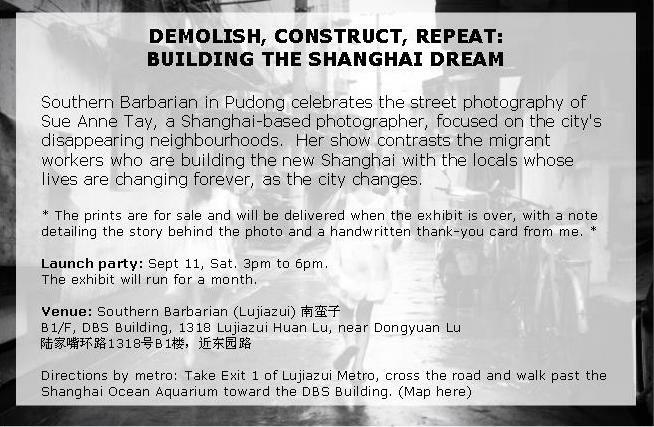 First of all, I have an upcoming photo exhibit that is launching this Sat, 11 September. This is all most exciting and I cannot begin to thank the folks at Southern Barbarian who have been so kind to host my work. Second, as part of the obligatory publicity drive to promote the exhibit, I’ve been interviewed by the local magazines including That’s Shanghai, City Weekend, NeochaEDGE (more to come). Third, I have an online photo essay coming out in the next day. (details to come) my photo essay on the first bat mitzvah in the Ohel Moshe Synagogue in Shanghai, which now serves as the Jewish Refugee Museum, is now in The Atlantic, “Being Jewish in Shanghai” which is wonderfull written by Adam Minter. Many thanks to the Rosens who allowed me to participate in such a significant occasion. Finally, this site will soon be migrating to a webhost with the specific purpose of overcoming the firewall here in China. I currently use wordpress.com which is blocked for most readers in China, and so action has been taken. Or to be more accurate, a very generous and kind friend has helped me do this, we will celebrate her fabulousness in due course. Of course, I have you to thank, dear reader, for taking the time to stop by. Welcome to all new readers as well. I hope you enjoy the many stories that the city has to offer. He stood there holding a small styrofoam board with a bored expression that was only rivaled by the young boy next to him selling ice-cream with his shirt rolled up to his chest. Apparently, this man was in the business of buying back old mobile phones and transportation cards, amongst other things I’m sure, to recycle and make a bit of profit on the side. “How come you are buying back old Expo tickets.” I asked, “You selling them online or try to get back into the Expo grounds?” I joked. I asked to take a quick snapshot, he pondered for a moment and acquiesced. As I framed my shot, he suddenly swung the sign board right into my lens. He then proceeded to do a little dance, swimming the sign board all over the place just so it was impossible to photograph it. “What you doing, man?” I asked in bewilderment. If you don’t want me to shoot, just say so, I huffed. Ok, ok, he guffawed. As I tried one more time, he began his old antics again. This time, swinging the sign like a pendalum, cackling at his own wit. Afterwhich, he pointed west and drawled, “There are a bunch more people like me buying back Expo tickets down the road, why don’t you photograph them?” With that, he continued cackling. Exasperated, I spun on my foot and left. What a joker. What is the appeal of an abandoned building? A common question posed by every other person who happens to be squatting or doing brisk recycling scrap business, to me when I come snooping around. They sniff at the building, then at my camera, and scratch their heads. These are the friendly ones. The hostile ones literally chase you out, they tend to be the ones that have the most to hide: their status, their business, their families. My answer is it depends. The mood has to be right: The people, disinterested enough to leave you alone. Each floor seems to unveil something different, not just the view outside. There is the matter of the right music on Ipod. I sometimes like Explosions in the Sky, Bach’s Partitas for Violin No.2, Bob Dylan and even Guns and Roses. Music that complements the gravitas of the situation at hand. Heck, have you ever mounted narrow staircases with no banisters to Lady Gaga? Exhilarating. The environment and atmosphere: The air and garbage has to be dry enough so any stench would not be so overwhelming that your hands are preoccupied shooting rather than covering your nose. A sun-drenched room is the best, where rays bounce off walls and broken mirrors on the floor. The foundations have to be steady: Concrete floors are safe, though one has to watch for cave-ins; spots where soft cardboard is piled deceptively high that when you step in, the bottom is actually compost paper and your foot sinks right in. Wooden floors are tricky. Very tricky. I tried it in a large mostly-abandoned European house in Hongkou before, where half the wooden floor was sunken in. Each creak of the rotting wood gave me heart palpitations. Common sense dictates that you wear shoes, not slippers. I once stepped into a trio of fluorescent light bulbs which exploded under my slipper sole. My screams reverberated through the floor as the glass bits flew into my feet, it took me 10 minutes to extricate myself. The potential spectacular view: It may not be the Vue Bar on Hyatt on the Bund, Glamour Bar or New Heights off the Bund strip. But you can always be surprised. With the sweet spot, you could stand there for hours alone with your thoughts, the quiet air punctuated by the occasional blare of the tanker on Huangpu River. In this case, the view of Pudong skyline, like some far away land and era, from this abandoned building will not exist in a few years. Unforunately, urban development will throw up more buildings near the river front, obscuring any view for unfortunate tenants living further behind. Finally, the stories of chance encounters: Sometimes, squatters, recyclers or neighbors may tell you the history of the building and the neighborhood. This particular building used to be the Shanghai Yaming Lighting Company, established in 1923 and was the first lamp manufacturing enterprise in China. It subsequently created a joint-venture with Holland’s Philips Lighting. The factory subsequently closed and became a hotel. Yet, the outline of where the company name used to be on the building front is still visible. … play one last round of carom. … run around with a stick of celery. And just like that, the weekend was over. * Simply refresh page if slideshow fails to come on. Ta-da! Along a quiet part of Huoshan Lu (霍山路), an old, wrinkled woman was parked by the curb in a rattan chair, quietly fanning herself. Surrounding her were two young mothers and a child entertaining herself with an empty plastic bottle. They were lying on a thin rattan mat as if they were in a grassy park rather than dirty asphalt throbbing with heat. A few degrees cooler, it would have made for a lovely summer day. “That’s our mother,” a man waved in the direction of the old woman. “And those are our wives,” another man affirmed. The Jiang (江) brothers were part of a team of migrant labor from Anhui and Henan, dismantling and emptying all scrap materials from an old factory building slated for demolition. The ground floor served as temporary living quarters, together as a dumping and sorting ground for all the wood, clear glass, mirror glass and all other recyclable waste. In the distance, a group of shirtless men were playing cards and listening to a small transistor radio. I chatted with them at length, charmed by how similar they looked and amused by the elder (or younger?) brother who peppered me with questions, upon learning that I was from Singapore, how he could move there and make big bucks. “In fact, how about you bring me over to Singapore?” he asked. Everyone laughed. The following week, I returned bearing 2 copies of this portrait for them. The heat was unbearable and everyone had migrated into the building. The brothers were there, as were their families sans the matriarch. Pleased as punch, his wife pushed an ice-popsicle into my hand. “It’s too hot. Cool down, cool down!” she clucked. I stood there awkwardly holding the popsicle in one hand, camera in the other. Something had to give. And so, their son, who was eyeing my cold treat, got to slurp down another popsicle. Everyone won. ** For those still unable to view the slideshow, the photos are available in sequence after the jump. In the afternoon that I have been hanging out at a scrapyard along Huoshan Lu (霍山路), I noticed an old man shuffling quietly through with a small bag in hand. He was shirtless given the sweltering heat, and his age showed through his liver-spotted and saggy skin which hung loosely on his person. I followed him across to another scrapyard by Liaoyang Lu (辽阳路) and discovered him tidying up a large tarpaulin bag filled with plastic bottles. He had an odd movement about him. Upon closer examination, I noticed his shaking hands. His right hand shaking more than his left, he stared at his wares and mentally calculated its costs. I thought it made sense he collected plastic bottles, it’s light and portable, but you only earn about RMB 0.20 (USD 0.03) to one jin (斤) which is about 500 grams. I was standing amidst a group of men in charge of collecting recycled goods – wood, steel, plastic, rubber, junk. They bought scrap from individuals to sell in bulk to recycling plants. A young man sauntered over to assess the voluminous heap of plastic. A transaction was made with a modest sum exchanged. I could not help noticing the old man’s shaking hands while he waited for his payment. I wondered if he was being medically treated. The old man then shuffled off counting his money, dragging his dust encrusted feet and slippers. “He’s about 60, maybe 70.” One of the managers said in response to my question. “We try to give him a fair deal each time.” A look of pity flashed across his eyes as quickly as it disappeared. He then distractedly turned back to jousting with his buddies. Please do not use content from this website without the author's permission.